The ultra durable, heavy duty Rat Model 1 has always been hindered in popularity by it’s five once carry weight and large tactical looking 3.6″ blade. 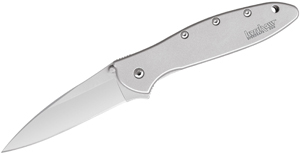 For those who have long awaited a more carryable knife from Ontario with the same excellent design as the Model 1, you’ll thoroughly enjoy it’s new smaller brother – the Rat Model 2. This 7″ overall EDC folder comes in at only 2.7 ounces while boasting a 3″ AUS-8 blade available with or without serrations or a black blade coating. It’s a much thinner profile as well making for a much more easily carried knife that you can still depend on for the most serious cutting tasks. Check out the new Ontario Rat 2’s with pink or black FRN handles at www.knifecenter.com. Jason Brous, the mastermind behind Brous Blades, is one of the great young craftsman on the rise in our industry. His first successful design, the Silent Soldier, was and still is among the most popular true neck knives we carry. 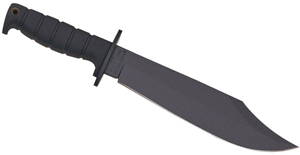 Soon after the Silent Soldier came out, a fixed blade with three distinct bevels was created called the Triple Threat. Now, just over a year later, we are pleased to see coming through our doors a very well done folding version of that wicked knife. 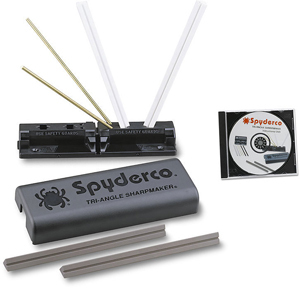 The 3-1/2″ blade is made from D2 tool steel and is a paired with a 4-1/2″ well textured and contoured G10 handle. Speed, ergonomics, lockup, fit and finish are right on par with knives of this price point. The Coroner is the large fixed blade model we just received in and it really is an awe-inspiring piece of work. Brous has a strong background in CNC-machine work and that’s readily apparent with this knife. 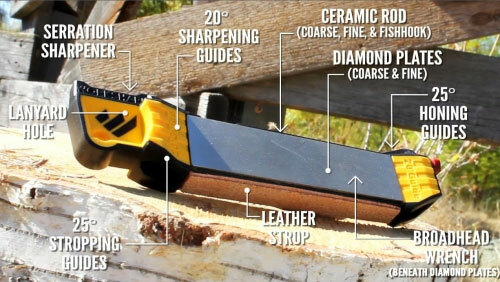 The 6-1/4″ spear point blade is a whopping 1/4″ thick piece of D2 tool steel but is not sharpened on both sides. The chainsaw-like serrations on the blade spine are extremely well executed and designed to unleash devastating, non-lethal, impact strikes. The milled G10 handle is a little small for gloved hands but it locks the heavy knife in the hand extremely well. Besides the excellent milling work on the blade, the sheath is not far behind as the best part of this knife. The friction fit Kydex sheath is as slim and sleek as it is functional; one of the best executed Kydex sheaths I’ve ever seen. These are two great overbuilt knives that you can be sure not many other people will have, check them out at www.knifecenter.com. The Tailwind Urban Tactical Stilettos are slim lightweight folders with quite a kick. They take the Stiletto design to the next level and you get an ergonomic, functional, and economical knife with a great tactical look. Available with the classic spear point blade shape or a more tactical tanto design, all are 7CR17 stainless steel blades coated in black for improved corrosion resistance. A double finder guard, deep carry bayonet clip, large lanyard hole, and solid liner lock are just a few of the many features on these knives. An excellent bang for your buck, check them out at www.knifecenter.com. If you’re looking for a smaller hawkbill style blade, what better platform could you ask to build off of than the famed Spyderco Delica. The Lil’ Matriarch is the little brother of the new Matriarch 2 and the tiny brother to the Civilian, a specialized tactical design from the early ’90s. The serrated S-Shaped VG-10 blade is not meant for utility tasks but is perfectly designed to act like a claw and rip through anything it encounters. Featuring the exact same handle as the Delica4, all the ergonomics and functions are the same but you get a much more useful knife in emergency life threatening situations. Sharp jimping on the blade spine makes for great control and the four way positional clip, which is parkerized not painted, gives you options. The Lil’ Matriarch is only available in a serrated model but this is in no way a disadvantage as the serrations work ferociously during pull and draw cuts. Check this knife out at www.knifecenter.com.